“I went through the trouble of making a killer playlist on my iPhone. The playlist took quite much time to create as it contained hundreds of songs I love. After managing the playlist finally, I thought it made a great playlist so that I can listen to on my computer. iTunes only transfer purchased files from iPhone to computer, which doesn't include playlists. iTunes will delete existing files when syncing to device. It's limited to just 5 iOS device, which should sign into the same Apple IDs. You can directly move files from computer to iPhone. You can access and view iPhone files on iTunes, but you cannot manage them. So the only way to export playlist from iPhone to computer is using iTunes alternative, which is shown below. Such professional iTunes alternative to transfer playlists is called iMyFone TunesMate iPhone Transfer which can transfer music, playlists, videos, photos, ringtones and 10+ more between iPhone and computer. You can also transfer to or from iTunes library. Export playlists from iPhone to iTunes library or computer in an organized way. Sync iTunes playlists to unlimited devices even in different Apple IDs, without data loss. Creat new playlists on iPhone and add music from computer or iPhone music library. Purchases & Non-Purchases: Transferring files between iPhone and computer includes iTunes purchased files or free-downloaded files. Automatic Conversion: Music or videos will be converted to be compatible while transferring. TunesMate received unbiased reviews from professional media, such as getintopc.com, tricksworldzz.com, crunchytricks.com and 20+ more. Step 1: You would need to connect your iPhone to your computer and launch iMyFone TunesMate. Go to “Music” tab. Step 2: On the left-side menu, you can select a specific playlist under “PLAYLISTS”. If you want to transfer all the music in one playlist, you can right click on the selected playlist and choose “Export to PC”. 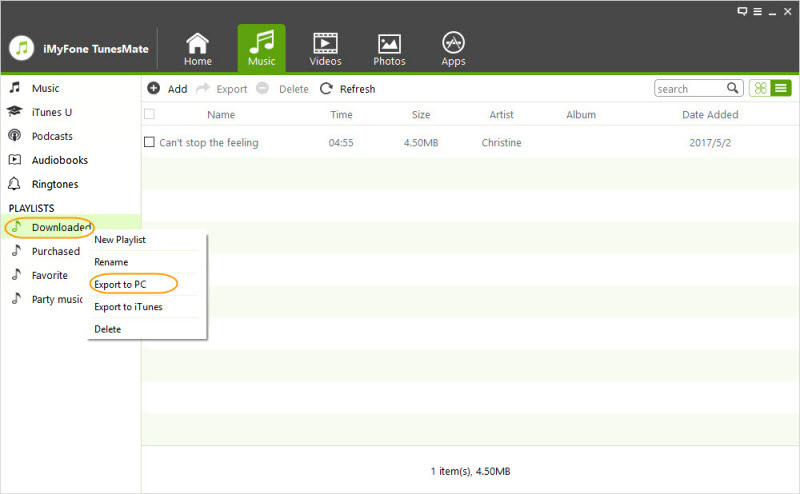 But if you just want to transfer part of the music in on playlist, select the songs and click “Export > Export to PC”. Step 3: Browse and choose the destination folder from the pop-up windows. Tap “OK” to start. When it finishes, you can tap “Open Folder” from the pop-up window to check the playlist on computer. However, if you do not transfer playlist from iPhone to the local computer but to iTunes so that you can sync it to your other devices, you still have your choice from TunesMate. It saves you the time and the trouble of downloading the playlist from scratch. To selectively transfer playlists, the steps are similar to the steps for transferring playlist from iPhone to computer. Just right click on the playlist and choose “Export to iTunes”. To transfer all iPhone playlists in one go, choose Transfer iDevice Media to iTunes from the home interface and check Playlists to transfer. With TunesMate, you can make your playlists looks great with all songs you love listening to in the same playlist. You will have your personalized playlist. 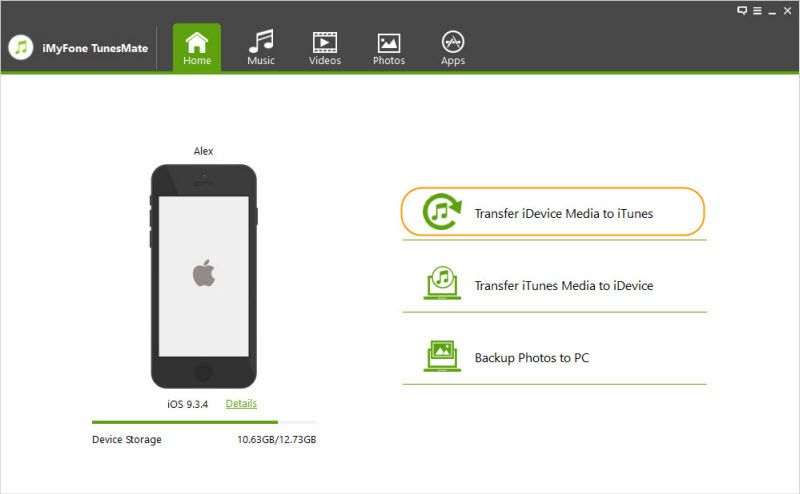 Besides, TunesMate also offers you ability to manage your media from your iPhone or iTunes library. You can rebuild your iTunes library with all your loved media files from your different iOS devices. Then you can transfer the whole iTunes library back to your iOS device. So you can have all your loved media in the same device. So why not give iMyFone TunesMate a shot? Also give yourself more choices.